Some developers specialize in frontend development, where they design web pages, lay out web page components, and control the behavior of these components as users interact with them. Some specialize in backend development, where they lay down the main logic rules and calculations used by the site and manage the storage and retrieval of data in databases. More versatile, however, are developers who can do both frontend and backend development, and these developers are called full stack developers. These developers eliminate the need to hire remote programmers for backend and frontend parts, and they can therefore lead to significant reductions in development costs. Of the estimated 16 million professional software developers worldwide, 28% identify as full-stack web developers. Full stack developers can combine any of the frontend and backend technologies for their development, but there are a number of technology stacks that are popular for use in full stack web development. Here are some of the common technology stacks that full stack developers use. The unified programming of the MEAN stack leads to better developer performance. You will also benefit from lower costs because of the shorter development time needed when using MEAN stack. Increased performance and lower costs means one thing for your business: increased profit! Let’s take a closer look at the different components of MEAN stack development. AngularJS uses data binding and the software engineering technique of dependency injection to reduce the amount of HTML code needed to execute the command. Since HTML is limited in generating and constructing web applications, AngularJS is the HTML that would have been designed for the purposes mentioned above. Before the advances in the HTML codes we use today, most code needed to be written by hand to work specifically with each application programming interface. Application programming interfaces like DOM are used to generate valid HTML and attractive XML documents. AngularJS takes the DOM and Ajax binding codes that were once individually hand written and organizes them into a precise structure. AngularJS was developed with the CRUD application in mind. So, when you hire a developer who has advanced knowledge in AngularJS, you get the expertise needed to a CRUD app. In terms of development, AngularJS saves development time because there isn’t a need to write large amounts of initialization codes to begin the work. Node.js uses the same language for coding on both the backend and frontend of development. This creates consistency between the two diverse web development parts. The result is faster, cleaner, more effective development that can work multiple processes. Node.js can perform independent processes at the same time without having to wait for one to finish before starting the other. This gives the program the aptitude to scale additional users, advance performance, and work at a larger level than synchronized software design. Looking for MEAN stack developers? Just leave your requirements and we’ll find dedicated MEAN stack developer for your project in 2 – 4 weeks! 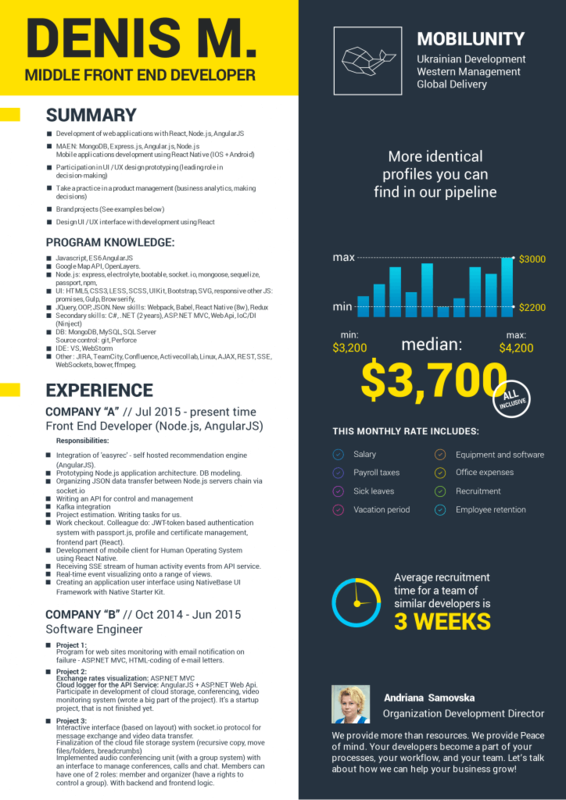 Average net MEAN developer salary in the USA starts from $4,000/month and can reach $8,000/month approximately. Still a lot depends on the experience, seniority, a project itself, and some additional costs that have to be spent for recruiting such a specialist. Hiring a MEAN developer in Ukraine will be cheaper although one may be surprised that cooperation with offshore and nearshore development companies may cost more than $2,500/month. Usually, such companies are ready to assist you in extension or building your development team within very short time, still their rates may be $1,000-1,200 higher. The main advantage of this difference is that their rates are all-inclusive and fixed. LAMP is another acronym for the technologies in the stack, namely Linux, Apache, MySQL, and Python/PHP/Perl. The defining feature of the LAMP stack is that all its technologies are open-source, meaning their codes are publicly available, and LAMP therefore has a huge support from the online community of developers. LAMP is commonly recognized as the option used to run active web sites and servers. Since high performance web applications require a compact, dependable foundation, LAMP Stack is the widely known for its capabilities in web application deployment. Although Linux, Apache, MySQL, and PHP are not intended to work together, they serve as an open source software alternative that are easily presented for the performance of dynamic web sites and servers. With LAMP Stack there are no default passwords needed for access. For security purposes, all passwords are created at the time of initialization. Because of its open source platform, LAMP Stack can effortlessly be run in the cloud. The advantage here is that you can run LAMP Stack locally or virtually. This makes it easy for developers to access the software from distant locations when changes are needed. Linux is a computer operating system gathered under the model of free and open source software development. Most Linux distributions are built around the Linux seed for software. They are sometimes based around a bundled management system. Because of the way these software collections are based, they deliver comprehensive LAMP setups through their packages. Apache is customarily the dealer of LAMP’s web server. The Apache HTTP Server has been the most widely used server on the internet. Developed and sustained by a community of developers known as the Apache Software Foundation, Apache is an open source software that supports many features. Most features are executed as compiled units that extend the functionality of the core of Apache. MySQL is a multi-processing, multi-user SQL database management system. MySQL that makes its source code accessible under the terms of the General Public License. The advantage of MySQL is that it makes integration of certain data fast and easy. PHP is the application programming language for LAMP. PHP is a server-side scripting language. PHP was created to be used specifically for web development, but has been used in some cases as general purpose programming language. PHP code is interpreted by a web server through a processor module. Once the code is interpreted, a web page is generated. The PHP language has advanced to involve capabilities for unconnected graphical applications. PHP now includes a command line interface capability. Every project has unique needs and different specifications. Full Stack Development benefits different projects in different ways depending on its use. Websites that serve large numbers of requests or require a high uptime benefit from LAMP Stack. MySQL provides internal replication mechanisms that deliver a unified relationship between the original database and its copies. LAMP Stack has the capability to experience downtime on the backend of a server without disturbing the services provided to the users on the system. This increased accessibility is another benefit of using LAMP Stack. LAMP Stack works well for complex development projects. Large e-Commerce businesses and fintech software are examples of projects that would benefit from LAMP Stack. Video streaming applications like YouTube rely on load processing to deliver to users. LAMP Stack has been valuable to development projects with heavy load processing requirements. 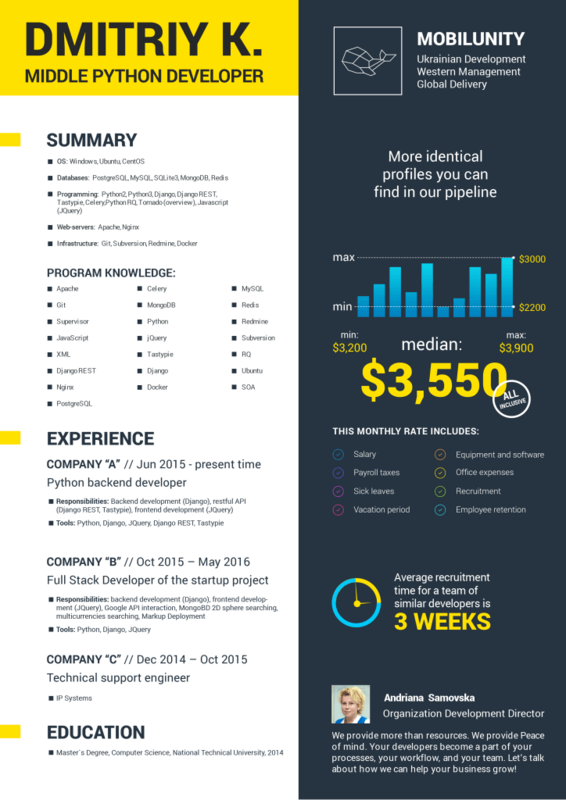 Just leave your requirements and we’ll send you full LAMP stack developer resume sample and rate! In the USA average salary for web developer with the knowledge of LAMP is the following: $4,700-$9,400 (net rates). In terms of Europe, LAMP developer salary may vary from $3,500 to $7,000. As with many software development jobs, there are benefits to hiring a dedicated software developer in Ukraine. If you want that your project benefits, you should consider Ukrainian developers as they have the needed skills, experience, and are able to provide superior work that you should look for when you hire. 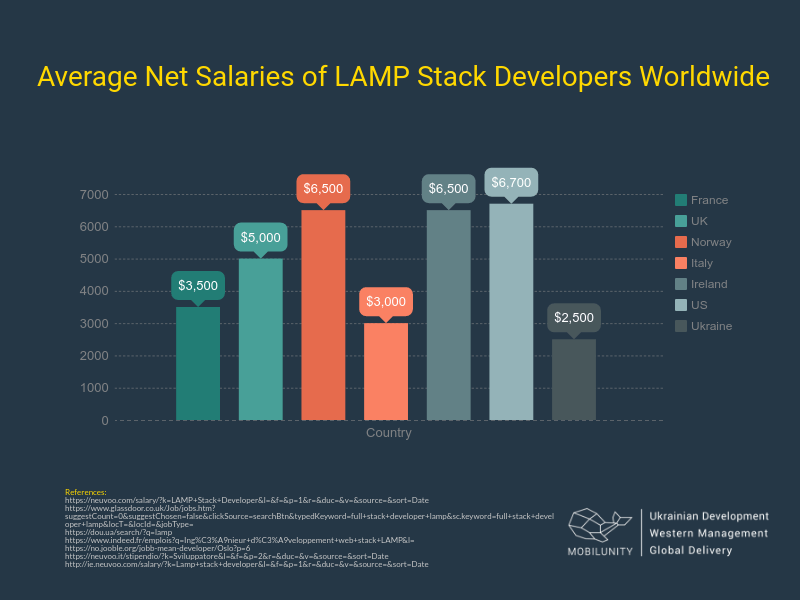 According to PayScale, the average annual full stack software engineer salary is around $24,000, while LAMP developers are usually offered $1,000-$4,000/month. This means you can get the development results you need at the most affordable rates. Although these are net salaries and rates, you still can benefit from a cooperation with Ukrainian LAMP developers. In case you decide to extend the existing development team with a LAMP stack developer and hire an outsourcing company for this purpose, they will easily find a needed expert very quickly as most of developers work for such companies. You should be ready that they offer $800-$1,200 higher rates, as they are all-inclusive, fixed, and much lower than net salaries of such developers in Europe or the USA. The Ruby stack is a technology stack hosted by Bitnami, an online library of software packages. It consists of Ruby, Ruby on Rails, Ruby Virtual Machine, MySQL, Apache, and PHP. The Ruby stack is known for being ready to run out of the box, because all its dependencies are already included in the package, and therefore enables very quick development. Ruby Stack delivers a complete solution for developers that is ready to run. Ruby Stack includes Ruby, Ruby on Rails, Ruby Virtual Machine, MySQL, Apache, and PHP. The programming language of Ruby focuses on simplicity and efficiency. The arrangement of Ruby is easy to read and write. Ruby Stack emphasizes a development atmosphere that is easy to configure. The development structure can effectively be run in the cloud. This makes migration possible between different platforms. Ruby can be run locally or virtually. This can be a great benefit to developers depending on the specific needs of the development project. Ruby on Rails gives a developer everything they need to build an amazing application. Many popular applications were built with the Ruby on Rails framework. If you ever used Basecamp, Hulu, Shopify, or SoundCloud, you have used an application constructed with Ruby on Rails. Ruby on Rails is an open source software. It allows developers to add to the existing code to advance Rails through their unique knowledge. This means future users will benefit from an enhanced software. A ruby virtual machine is a program that implements the ruby code. In other words, it reads the programming language, understands its commands, and implements the software. This allows the ruby code to execute the function it was written to deliver. The world’s most popular open source database, MySQL is known for its performance, reliability, and ease of use. Popular web-based applications like Facebook, YouTube, and Twitter have chosen MySQL as their database. The benefits of MySQL are that it works on many operating systems with multiple languages. MySQL supports large databases and works quickly regardless of the size of the data sets. This is a great advantage to large businesses. MySQL is also customizable which allows programmers to modify your software to meet specific needs. Apache is the most prevalent web server software used today. Many use Apache because it is fast, dependable, and safe. It can also be modified to meet the requirements of many environments. Apache can implement extensions and modules that allow it to meet the unique needs of various environments. Having a dependable web server is vital to your website. The role of a web server is to check the internet for the web page requested by a user. The server then delivers the request in a viewable form. Apache communicates with your website, delivers any requests made by the user visiting the website, and makes sure all units are running the way they should be. When you type in an HTTP request, Apache runs a few security checks before it brings you to the webpage you requested. Having a dependable and protected web server is critical to your business for this reason. PHP is a general-purpose scripting language that was originally created for web development. It can be implanted into HTML. PHP implements code on the server then produces the HTML to be sent to the client. PHP offers many innovative features for expert programmers. Ruby Stack is useful in simple development projects because of its uses faster, easier coding. Landing pages and simple online stores are two examples of development projects that would benefit from the skills of Ruby Stack developers. For projects that have a smaller deadline to market their product, Ruby Stack provides fast deployment to meet these time restraints. Hunting for RUBY stack developer? Leave your requirements and we’ll help you to find dedicated RUBY stack developer ASAP! Ruby Stack is a protected, reliable development structure that assembles a seamless library for fast application development. 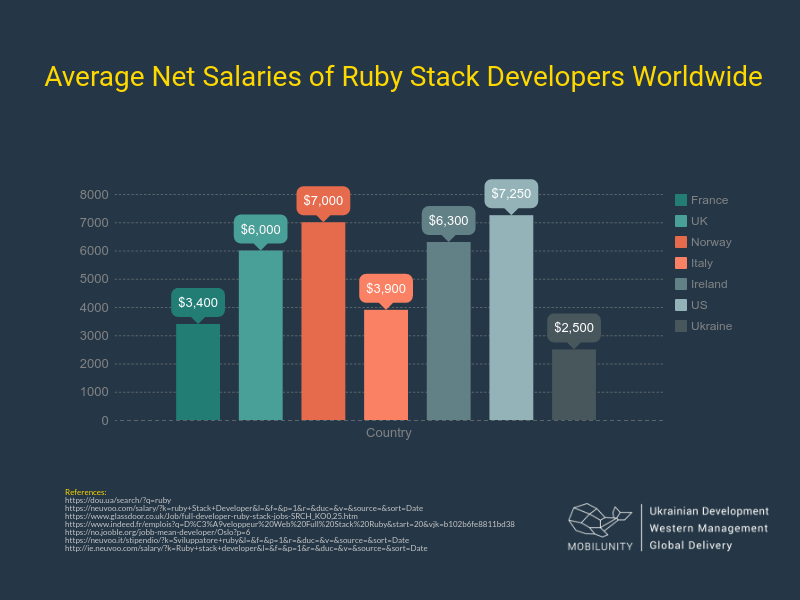 Average European full stack Ruby programmer salary is $4,400-$10,000 (based on experience). In the USA average full stack developer salary gets $86,875/year or $7,250/month in average (excluding additional charges for recruiting). In Ukraine Ruby web developer salary may be $1,500 to $4,000 depending on the experience, company, project, and scope of work. Senior full stack developers in Ukraine are talented and skilled in the ins and outs of Ruby Stack development. 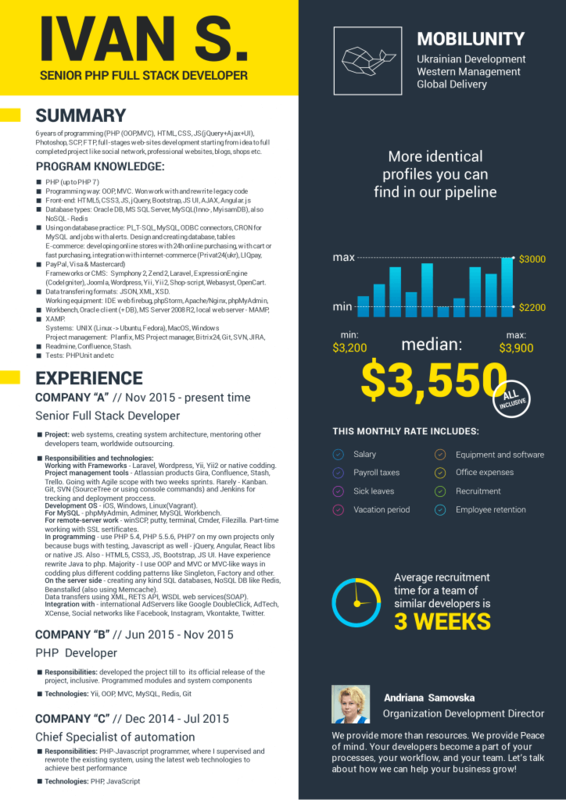 The average monthly lead or senior full stack developer salary is $3,300 per month. When you hire a senior full stack developer in Ukraine, you profit from competitive rates with superior results. In case you have decided to outsource the development to Ukraine, for example, or want to build a dedicated remote development team there, you should be ready that the rates of developers will be $1,000-1,200 higher as the provided above salaries were net ones. The nearshore and offshore development companies usually offer all-inclusive fixed rate, that in any case may be lower than hire developers on a local market. The Django stack is another Bitnami-hosted technology stack. Also known as Full Stack Python, it consists of Python, Django, Apache, and MySQL. Like the Ruby stack, it also boasts of quick development and environment configuration times, making it suitable for small, quick web development projects. Django stack is also known as Full Stack Python. This web application framework is a popular choice by developers who regularly construct web applications. One of the rewards of Django stack is that Python web applications come with a complete outline that eliminates the need for individual libraries for each function. Certification, URL routing, template engine, object-relational mapper, and database schema migrations are all included in the Django stack framework. This makes Django appropriate for small web development projects that require quick results. It’s speedy development and configuration times help developers complete projects in record time. The main goal of Django stack is to reduce the complexity in creating database-driven websites. Django works to reduce repetition by emphasizing reusability. It uses universal components that can effortlessly be plugged into other projects. Django is known for quick development because of its focus on finding components that can be plugged in to other projects. A serialization system that can deliver XML and JSON. Both are Django model representations. Django’s configuration system permits third party code to be plugged into a regular project. More than 2500 packages can be used to increase the framework’s original behavior. This delivers capabilities not available from the original framework including: registration, search, API provision and consumption, and CMS. Although the extensibility of Django is helpful, it is lessened by internal components dependencies. The auth and admin bundled applications need an internal ORM because reusable applications generally depend on these. This inspires developers to use the official stack to take advantage of the applications entire ecosystem. Django can work in concurrence with Apache, Nginx using WSGI, Gunicorn, or Cherokee using flup. It can launch a FastCGI server. This allows developers to use Django from the backend of any web server that supports FastCGI. Django supports four databases including PostgreSQL, MySQL, SQLite, and Oracle. There are no distinct units needed when you want to develop a Django project. The standard text editor is used to edit the source code. When you use a professional developer, however, you will increase the productivity of development. Repairing, refactoring, and unit testing can also be added to Django support through cohesive development atmospheres. In addition to traditional support by Django, there is a semiannual conference for Django developers and users. “DjangoCon” is held annually in Europe and the United States. This is a valuable training tool for Django developers. Popular websites that use Django Stack are Instagram, Mozilla, The Washington Times, and the Public Broadcasting Service. Django stack is like Ruby Stack in its emphasis on simple, fast coding that leads to shorter deployment times. Struggling to find Django stack developer? Just leave your requirements. Mobilunity team will help find dedicated Django developer for your project! All these simplifications and advantages lead to the next, if you hire Django full stack developer, you should be ready that their rates are higher than of other full stack developer. Average salary web developer gets with Django skills depends much on the level of an expert. Thus, in Ukraine net developer rates may vary from $1,000 to $4,000 depending on the project, working conditions, and level of a developer. European experts usually are offered in average $5,500-6,000. 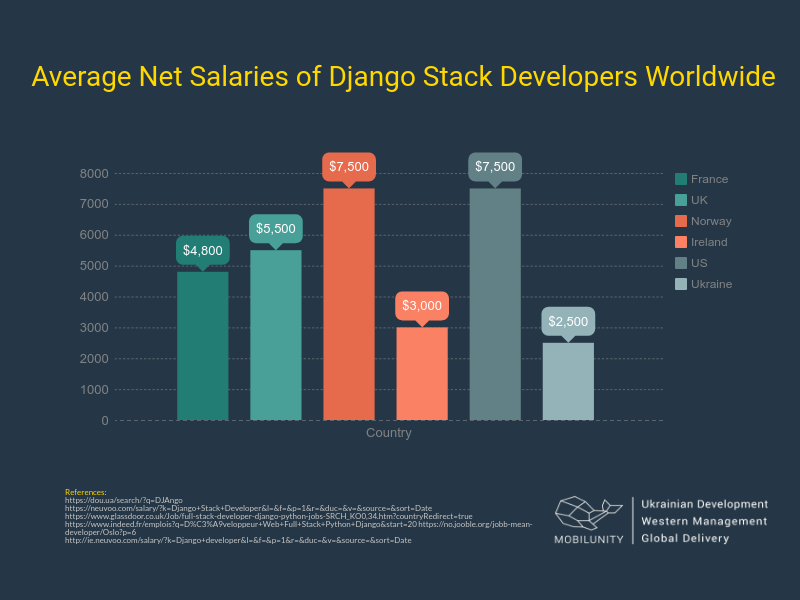 Net US salaries of Django stack developers vary from $5,300-$10,500. As it was already mentioned in the previous paragraphs, hiring a developer at the nearshore development company may be more expensive as the rates provided above don’t include taxes, office expenses, and recruiting. Thus, don’t be surprised when an offshore development company offers you to find a Django developer at higher but all-inclusive rate. In order to provide you with the full report on the comparison of different salaries in Europe, we have also prepared the research on an average front end vs back end developer salary and rates of full stack developers for you to compare whether it is possible to save hiring different devs or one only. As far as we can see from the table above, average front end developer salary in the USA is $67,743, while the back end developer salary is $72,043. Backend vs frontend salaries in Canada (Toronto) are the following: $110,152 vs $99,214 per year correspondingly. These 2 countries offer the highest rates to developers based on our research. Ukraine and Romania belong to the countries where a front end developer or back end developers have much lower salaries. Thus, in Romania average junior front end developer salary is $25,143, and a back-end developer gets $28,456 salary per year approximately. The reasons for such tendency were stated already in this article above. 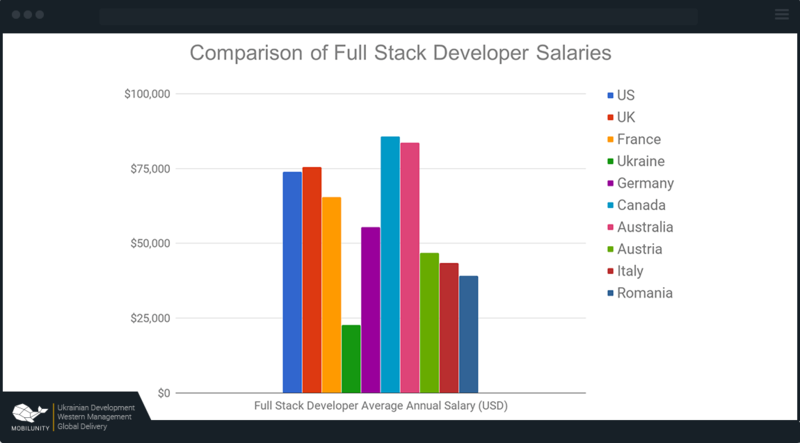 Now you can compare these rates with the rates of full stack developers provided below and you will see why companies prefer hiring a full stack developers than to have 2 programmers in a team. As you can see from the rates provided above, web developer salary in UK (London) and US (NYC) are not the highest ones, although the salary of these devs in other countries are even lower. 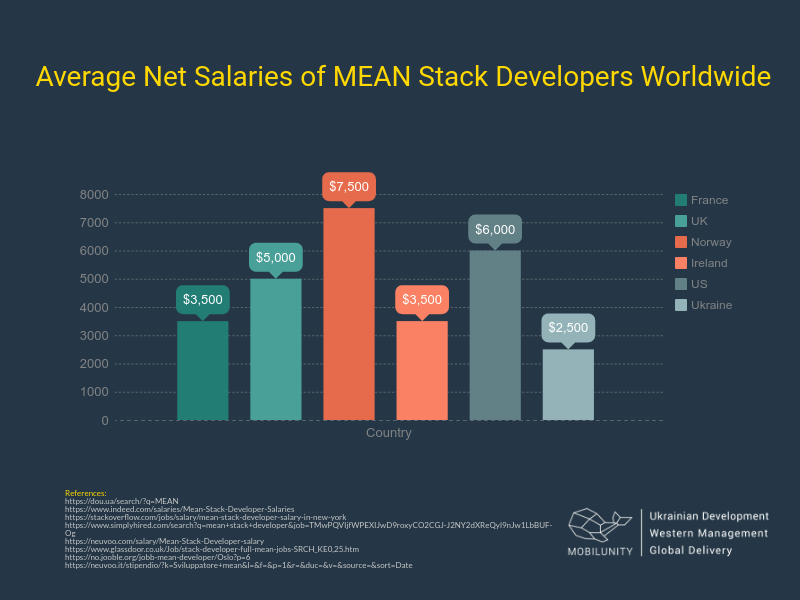 Clearly, Ukraine offers a much, much lower full stack developer salary compared to other major European countries. To hire full stack developer from Ukraine would therefore be a wise choice. We’ve shown that full stack developers are an asset to any company because they reduce development cost and time. If you want to get into more details about what does full stack developer mean and what does a full stack developer do, we have a blog dedicated to this thematic. 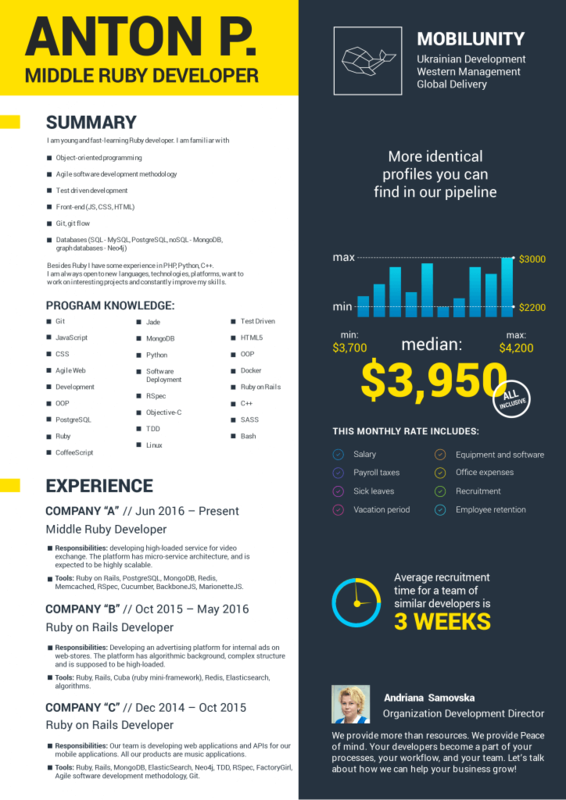 Hiring dedicated full stack developers from an offshoring company like Mobilunity, which is located in Ukraine, can give you priceless benefits since full stack developer salary in Ukraine is much lower comparing to other countries throughout Europe. 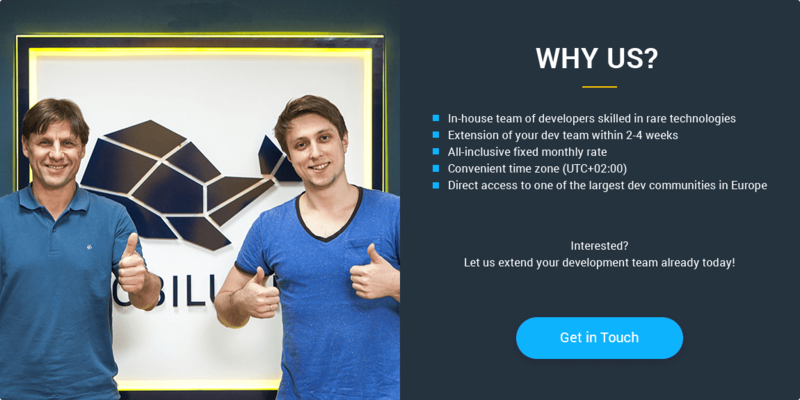 Being only at most an hour or two away from most European countries, we offer minimal time zone differences from anywhere in Europe, and we offer the lowest rates for highly skilled full stack developers. Here at Mobilunity, we house excellent developers at exceptionally affordable rates! Read more of our blog about Ada developers and their salaries.